November 3rd is my Dad’s birthday. Dad was made a sealer when he and mom were on a mission in the Philippines. 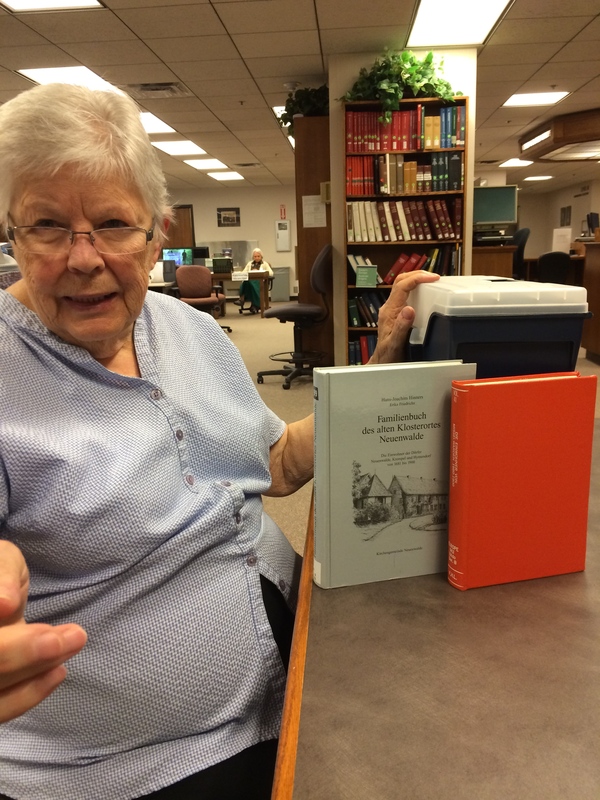 When they returned I invited mom to start coming to the Family History Library with me. I’d started to go once a week and was working on her Scottish line. Mom joined me and we searched for quite some time and tried to understand the programs and trace family names so we could do temple work. It was like looking for gold but finding only coal. Most of her line had been researched and temple work had been completed. We really wanted to find some ancestors whose names we could submit for temple work. That is when we decided to branch out to Dad’s line. Neither one of us spoke Dutch but we plowed ahead. I remember the first day we found a family name that really needed to be done. It was so exciting, I shared our joyful news at a ward dinner that night with friends. It was monumental to me. It was a gold nugget. 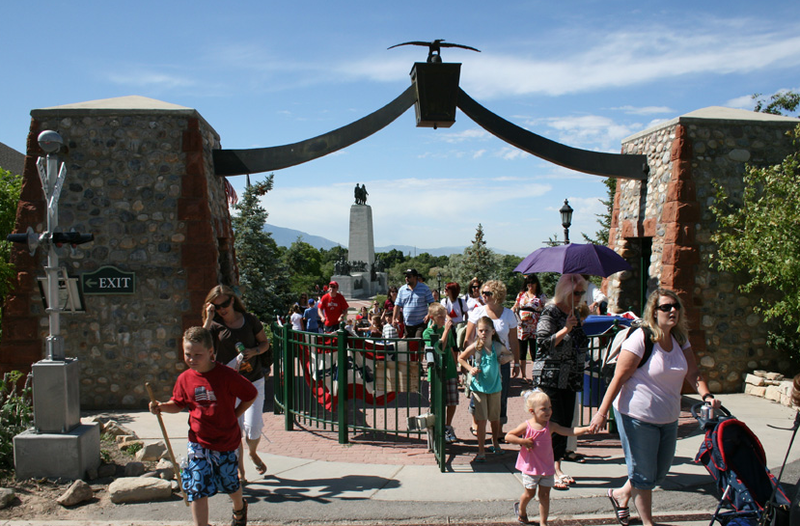 We eventually were blessed to cull thousands of names from Dad’s Dutch ancestry and he was able to perform the sealings for his ancestors with us, his children and mom, as proxies in the Jordan River temple. It was one of the sweetest gifts we could have shared. It was gold. 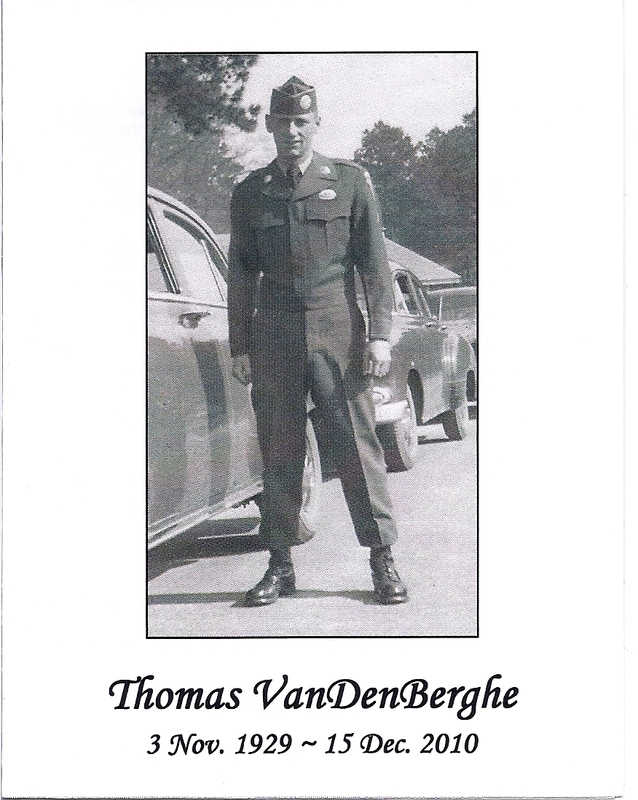 Today the 4000+names for which Dad’s father had researched has grown to almost 40,000 names. To celebrate Dad and honor him on his birthday we will do a sealing session on the greatest single genealogical discovery we have made in the past 17 years. It was not panning in a river for gold but a direct hit of a marvelous vein of precious metal. But, it happens to be on Mom’s line. Hastening of the work is in full swing here. It took almost years to come up with the names we have from the Netherlands but in months we have compiled thousands of names of direct and collatoral lines. I think Dad not only said yes, but is helping with the conversion of not just one congregation but centuries of a parish’s families who are now offered the fulness just like the early congregations in England. This experience has been and will continue to be mined for a long time. It is pure gold. I hope everyone will put this on their calendar that is related to the Redd family…July 25, 2015 at This is the pPlace Heritage state park. Go to reddfamily.org to register. 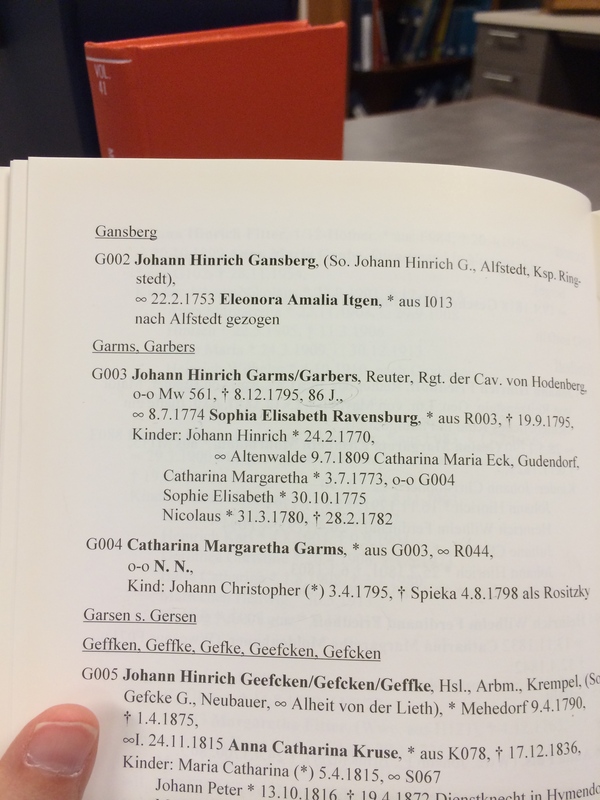 I still remember the first time we found a name of one of our ancestors after a year or two of going to the library. We started with Mom’s Scottish line and everything we found had already had the temple work done. They drove us to do something wild and crazy. Attempt to read dutch and search dutch records. Well, we’d been working on Dad’s line and after a lot of effort we finally found a relative needing the temple ordinances. That evening it just so happened there was a dinner over at the Ward. I remember sharing the joyous news with George Young who weighs well the meaning you assign to what you share with him and has the gift to care about what others care about. Well, that day has been surpassed. Tuesday, Mom picked me up to go to the library. She even told Nancy and Carol to go to the temple without her. The week before we’d met with Maria Eppich, a Polish researcher who works at the FHL on Tuesdays. She is from my ward and offered to help me with my Polish line but explained we have to know the German stuff first. She introduced to the a competent FHL German assistant. 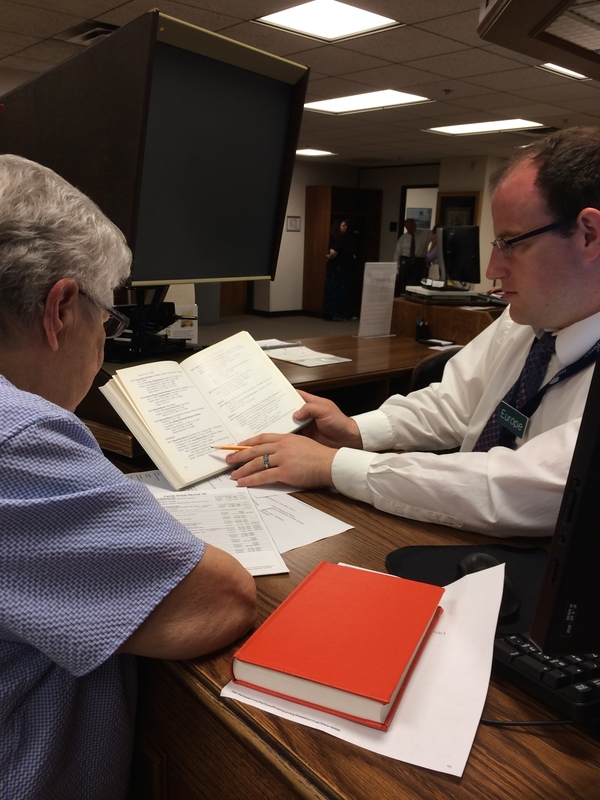 When Mom picked me up Tuesday morning I was finishing up a difficult phone call and so, being distracted, I forgot to pick up the genealogy folder with our Rositski info from the week before. 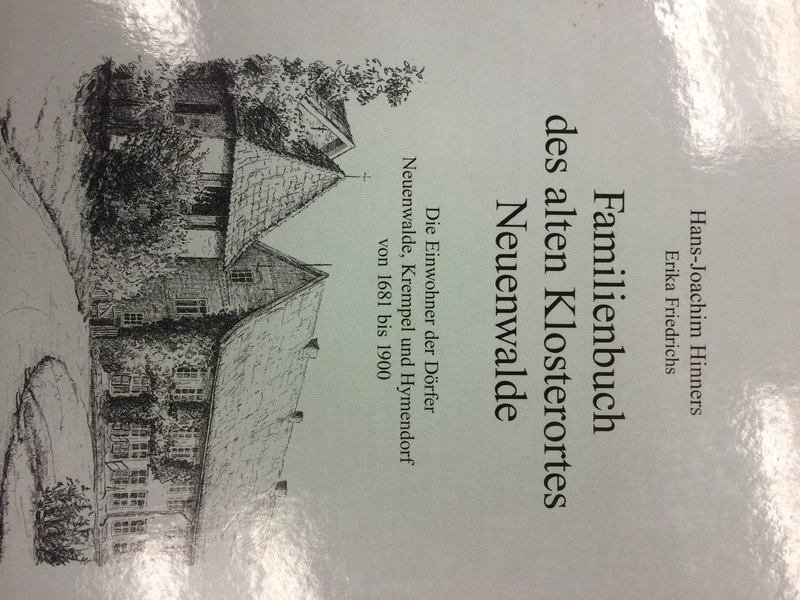 We got to the library and I had to finsih up some phone calls so handed mom the one thing I had remembered to bring – a copy of an email from the German archive we needed translated. When I finally returned, Mom was at the desk showing the email to the competent FHL German assistant. It was indeed what I thought it was, a response that they couldn’t find the record in their archive. How curious, we knew it had to be there. We had seen a copy of the original on microfilm the week before but simply needed to see the original which they had and might have updated information written in a column- something like, this illegitimate child was legitimized on such and such date with the marriage of the parents. This is not uncommon record keeping we have seen from other parishes in Europe. Well,the experts don’t always get things right. I’m realizing if anyone is going to be led by the spirit it is probably those closet to those spiritual guides. Translation? It is probably more likely that our ancestors can and will prompt us rather than a third party. With a sigh the FHL german assistant suggested we go look for the marriage in the microfilm sometime after the birth of the illegitimate child and before the birth of the next child. Not having our folder with the previous week’s notes in it, and being in a hurry, I asked if he would look up the film number for me. It was odd that I requested that because I know perfectly well how to do it myself. It would have taken just a minute. I remember thinking, what a curious request I just made. I took the slip of paper from him and hurried to the stacks. “Save our place Mom.” I said, and eagerly ran off. When I returned he was just finishing up helping another patron whom mom and invited up to the counter. I smiled inside, thinking Mom always does the right thing. I placed the book on the counter. He opened it and what spilled out was organized, easy to read typed font with pedigree information revealing that our hypothesis was accurate. Not only that, but it contained a record of different parents than we had on our family group record. 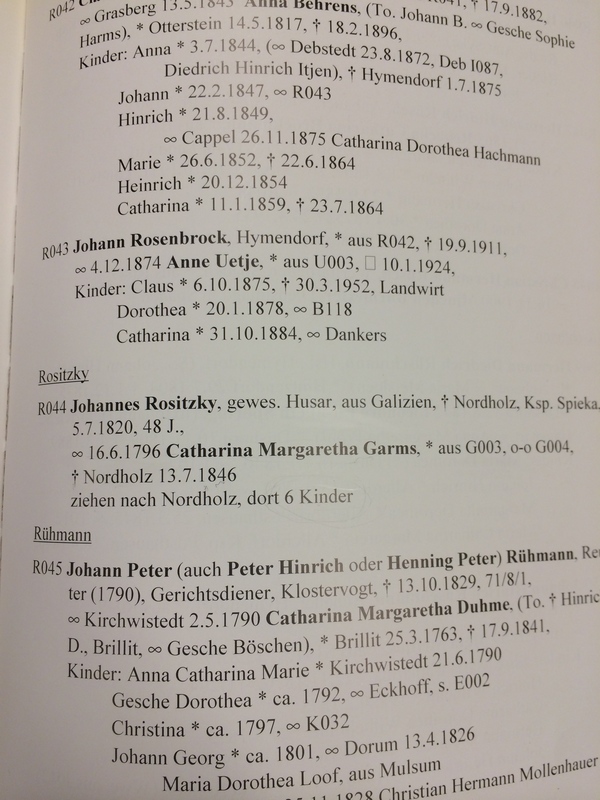 And here was the proof of births, deaths, marriages, families, from this parish that were our family no one had ever known about. It proved that the 9+ generations of hundreds of Germans some Burt family genealogist had proclaimed as our line were indeed not ours. 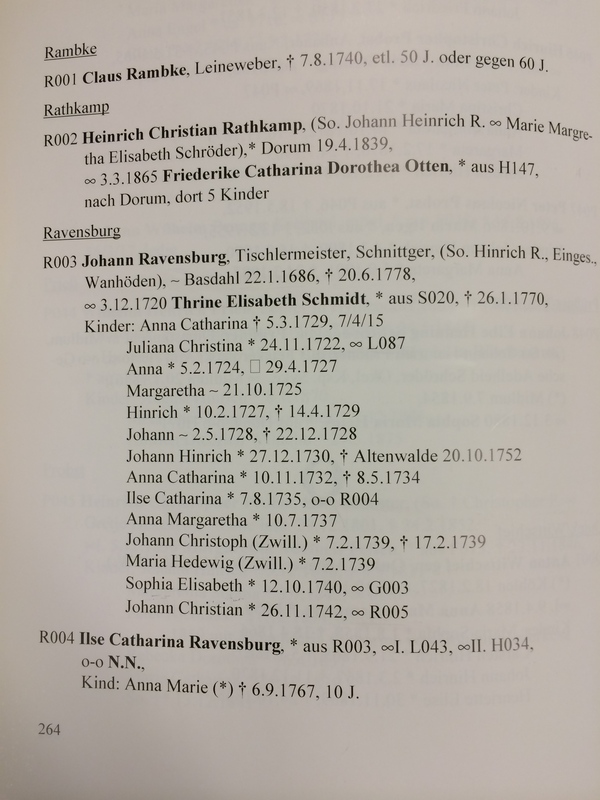 We had proof of the real father and in that discovery now have close to 50+ names and relationships and the potential for understanding where to search for more. I hugged mom, clapped for joy and felt my eyes tear up as he turned from page to page showing how to read the beautiful grey book that to me looks an awful lot like a family bible. It even refers to family events in other parishes, e.g. the orange book to the side.